Windows 10 Anniversary Update has brought plenty of changes to the operating system. Apart from system specific bug fixes, it has now added 'Windows Subsystem for Linux' feature. This feature allows users to install Ubuntu Bash shell on Windows. 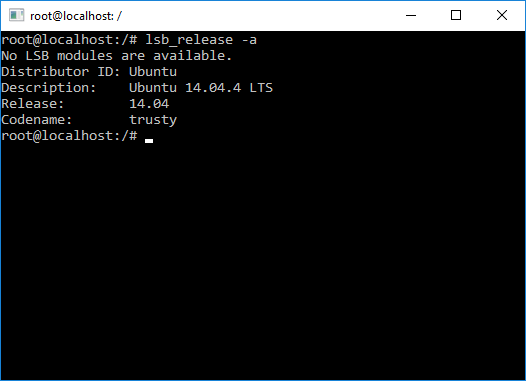 In this article, we explain how to setup Ubuntu Bash shell on Windows 10. Microsoft has now started to extend it's open source approach by accepting the features from Linux. Importing Bash Shell into Windows 10 is one step towards being more open towards other platforms. Though bash shell support is still in beta, in future Windows is likely to be more supportive towards open source technologies. Here's a step by step guide on how to Install Ubuntu Shell into your Windows 10 operating system. You need the following in order to install the bash shell. In order to install the bash shell you need to install recent update of Windows 10. This update contains the installer that will add the functions necessary required for running bash script. So make sure that you have this update installed on your computer. Before we install bash shell we need to enable the developer mode. Follow the instructions below. 1. Click on Windows logo button. 2. Click on Settings Link. 3. On Settings page Go to "For Developers" tab. This process enables developer mode. Now we have to enable the Windows support for subsystem. This helps the system to run linux specific commands on the Windows machine. Follow the instruction below to enable this support. 2. Go to Control Panel. 4. From Programs and Features options > Click "Turn Windows Features On". 5. 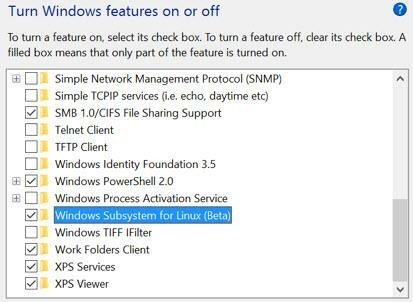 Enable the "Windows Subsystem for Linux (Beta)" option. After you exit from this you'll find Windows 10 has now enabled developer mode and also enabled support for Subsystems. In order for these changes to take effect you have to reboot the computer. Once you complete the reboot you can then proceed with the Bash installation. Follow the instructions below for Bash execution on command prompt. 2. In search bar type "Bash". 3. Click on the "Bash run command" best match option. 4. This should download the "Bash on Windows" from Windows Store. Make sure you're connected to Internet to perform this action. 5. At the end the success message will be shown. This step installs bash on your Windows 10 computer. You can now go ahead and execute some of the following Bash commands. pwd : Lists present working directory of terminal. cd: Changes the directory into specific directory mentioned by you. rm : removes directory or file. You can go through the bash commands by searching on google. The support for bash doesn't stop at basic commands. You can also execute "Debian" specific commands on this terminal. For example you can install the Linux based software such as gcc on Windows. You can type the following command on your bash terminal to install gcc. By default the bash shell gives you super user access on terminal. So make sure that you're not running any random bash scripts that you download from the internet. Know what you are downloading and executing on this shell. Make sure you keep the administrator only access for this terminal. This should reduce the issues of running Linux specific virus on your system. Software installed from Bash shell is restricted to the functionality of the bash shell itself. It can't be executed on any other parts of the Windows for now. In future this may change and you may get more control of the operating system with the shell. You can't use power-shell to interact with software installed from bash shell and vice versa. This shell is by no means a complete Linux kernel. It is just a terminal being ported to the Windows 10. It has it's own set of limitation due to restrictive nature of Windows core. This shell was ported to windows with the help from Canonical team. That's why it says "Bash on Ubuntu on Window" when you open the bash terminal. Bash shell on Windows doesn't do much for the core operating system itself. However it let's system admins and power users to use the bash on Windows. It can also be a good tool to learn bash shell scripting on Windows. It can be used for many other Linux specific tasks to be executed from Windows machine.